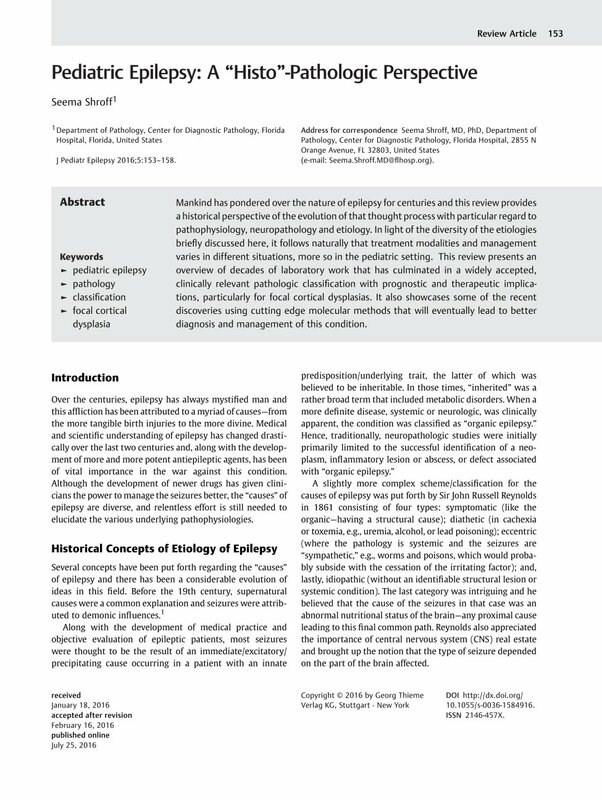 Mankind has pondered over the nature of epilepsy for centuries and this review provides a historical perspective of the evolution of that thought process with particular regard to pathophysiology, neuropathology and etiology. In light of the diversity of the etiologies briefly discussed here, it follows naturally that treatment modalities and management varies in different situations, more so in the pediatric setting. This review presents an overview of decades of laboratory work that has culminated in a widely accepted, clinically relevant pathologic classification with prognostic and therapeutic implications, particularly for focal cortical dysplasias. It also showcases some of the recent discoveries using cutting edge molecular methods that will eventually lead to better diagnosis and management of this condition. 33 Myers CT, Mefford HC. Advancing epilepsy genetics in the genomic era. Genome Med 2015; 7: 91 DOI: 10.1186/s13073-015-0214-7. 37 Prayson RA. Dual pathology in Rasmussen's encephalitis: a report of coexistent focal cortical dysplasia and review of the literature. Case Rep Pathol 2012; 2012: 569170 DOI: 10.1155/2012/569170.